I am a United supporter, if you feel this makes me incapable of writing about Liverpool FC's finances in an impartial way then I believe you are wrong. If that is however your view, I suggest you don't waste your time reading on! Under Hicks and Gillett, the Liverpool structure became more complex than in the days of the Moores family. There were two main UK holding companies; Kop Football (Holdings) Limited ("KFH") and its subsidiary Kop Football Limited ("KF") which in turn owned The Liverpool Football Club and Athletic Grounds Limited ("LFAG"), the football club itself. KF was the entity that borrowed the vast majority of the money from the banks. At 31st July 2010 LFAG's debt was limited to an inter-company loan to KF of £104.6m and bank loans and overdrafts totalling £37.7m. The two Kop companies are late filing their accounts (not surprising given they no longer have any operating businesses). The accounts I look at in this post are for LFAG so they tell us about the operations of the football club, but not much about the debt, although this is not a major issue as the debt was largely eliminated after the purchase of the club by John W Henry's Fenway Sports Group (through its UK vehicle, UKSV Holding Company Limited). The LFAG accounts for 2009/10 include the club's digital and online business which were bought in from a separate company, LiverpoolFC.TV Limited ("LFCTV") in July 2009. To make a sensible comparison between the 2008/09 and 2009/10 we have to adjust the 2008/09 numbers to include the operations that were in LFCTV during that year. The club also brought its catering activities "in-house" in 2009/10, but we have no numbers on this business and it is unlikely to be material. At a headline level, revenue appears to have risen 4.1% in 2009/10 but adjusting for LFCTV, the club actually saw a decline of 0.1% during the period. Matchday income rose 0.9% as the club played the same number of games as the previous season (27), with slightly lower attendance (-1.8%) and slightly higher ticket prices (there is probably a mix effect in here too as the club could not command premium hospitality prices for Europa Cup games). Although Premier League income fell as the club finished 7th vs. 2nd the year before in the league, this was more than compensated for by higher Champions League receipts. Last season was the first of a new three year cycle of Champions League TV rights and Liverpool benefited in particular from their 2nd place league finish in 2008/09 which increased their share of the English "market pool". Early exit from the Champions League at the group stages was rewarded with entry into the Europa League. The difference in TV income between the two competitions is stark, with Liverpool's run to the semi-final only earning £2.5m, barely 10% of their Champions League income. 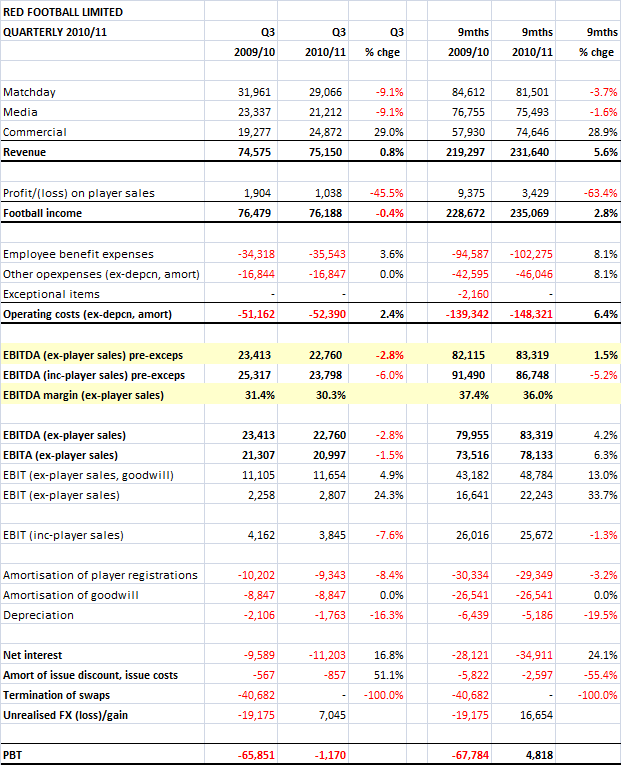 Commercial income fell 8.3% last season (taking into account the buying in of LFCTV in July 2009). The accounts blame this on a "decrease in royalty and merchandising revenue", but the fall is quite severe to just be blamed on this. It is possible that some of the club's sponsorship deals contain Champions League qualification or league position clauses which kicked in after the poor season. As with income, it is important to adjust for the LFCTV business (in the 2009/10 numbers but not in the 2008/09 figures) to see the underlying cost trends at play. 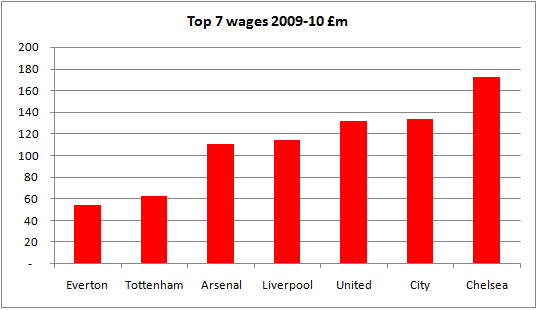 Adjusting for LFCTV, and pre-exceptional charges, the club's salary bill rose £16.5m or 16.8% on 2008/09. With the obvious exception of Manchester City, this is by far the largest rise in salaries of any non-promoted Premier League club last season. 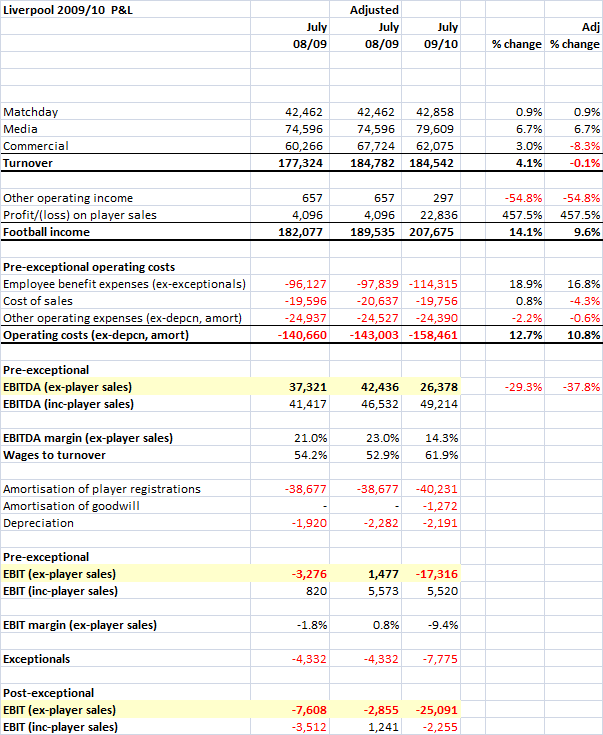 It also compares very unfavourably with the fall in revenue (City's wage bill rose 61% but at least turnover rose 44%). 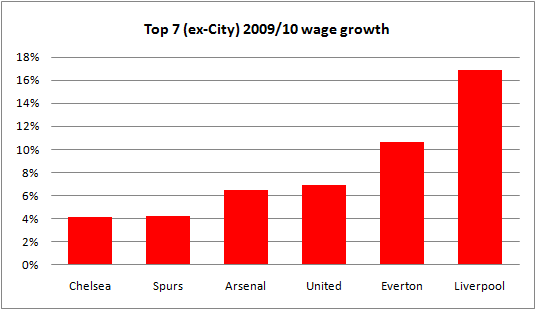 The increase compares to Chelsea's 4.2% increase, Spurs' 4.3%, Arsenal's 6.5% and United's 7.0%. The huge increase in salary costs did not coincide with major spending in the transfer market. The 2009/10 season saw Liverpool sell Alonso and Arbeloa to Real Madrid with Hyypia and Pennant also leaving the club. Aquilani, Johnson and Kyrgiakos joined in the summer and Rodriguez in January. Those moves would probably suggest a small fall in wages in total. Given a relatively stable squad, the only explanation for the enormous rise in staff costs during 2009/10 is the raft of contract extensions signed by the club during the period. In March 2009, Benitez signed a four year extension, Gerrard a two year extension in April 2009, with Agger signing in May, Benayoun in July and Torres(!) in August. In April 2010, toward the end of the financial year Reina signed an extension too. It is these six deals, especially Benitez and Gerrard's that drove up the total salary bill so much. Liverpool's wage bill sits in the middle of the pack of clubs with aspirations of Champions League qualification, higher than Arsenal's, but around 15% lower than United's and City's. 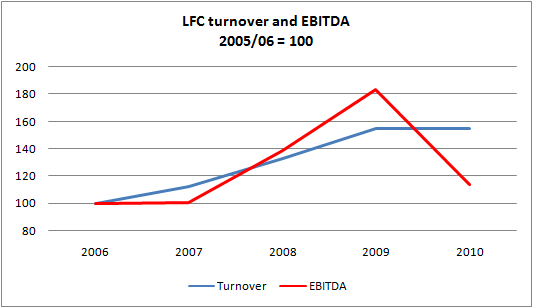 Adjusting for the inclusion of LFCTV in the 2009/10 figures, the club managed to hold other costs in line with the prior year (the small cost of sales line was down 4.3% and other costs, ex depreciation and amortisation fell 0.6%). With underlying income down 0.1% and wages rocketing up, the impact on EBITDA (earnings before interest, tax, depreciation and amortisation) is going to be obvious. Pre-exceptional EBITDA fell to £26.4m from an adjusted £42.4m (which includes £5.1m of EBITDA from LFCTV), a fall of 37.8%. The unadjusted headline decline was 29.3%. As a measure of profits, EBITDA has certain drawbacks, and in football it clearly ignores the significant expense of transfers, but I believe it is a decent proxy for comparing the financial strength of clubs. 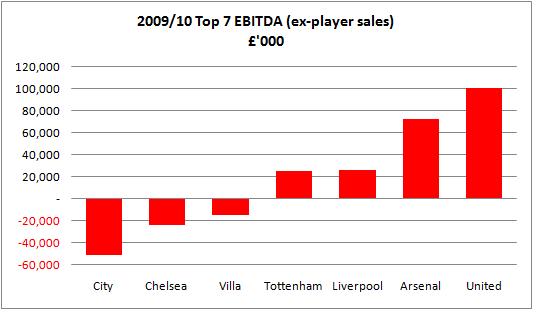 EBITDA can be seen as the pre-transfer cash profits a club generates. It can be used for transfer spending or to support debt (such as any borrowing a club takes on to build a new stadium). It should be noted that of United's impressive £100m EBITDA, c. £45m goes out of the club each year in bond interest payments. What is concerning for Liverpool's new owners, is that EBITDA has fallen so sharply (and so far behind rivals such as United and Arsenal) in a season when the club actually earned significant sums from the Champions League. The fall is not really due to a poor season (although 2009/10 turned out badly), but because of costs running out of control. It was with this inflated cost base that Liverpool entered the truly poor 2010/11 season. The club is undergoing a margin squeeze that has pushed EBITDA back below 2008 levels even as income has held up. The EBITDA of £26.4m is before exceptional items. In 2009/10, there were exceptional costs of £7.8m relating to firing Rafa Benitez and his backroom staff. In 2010/11 there will of course be further charges relating to the departure of Roy Hodgson and his team. Until recently the player contract amortisation charges reported by football clubs was of only academic interest. The charge reflects the accounting rules relating to transfer spending. Transfer fees are spread or "amortised" over the length of a player's contract. The introduction of UEFA's Financial Fair Play rules, which includes the amortisation charge in a club's "relevant expenses" calculation makes this number suddenly quite important. Because transfer fees are spread over the life of each contract, a period of high transfer spending will linger in a club's accounts for several years. Liverpool's amortisation charge rose to £39.9m in 2009/10 from £37.4m the previous year. With the exception of Chelsea (in previous years) and Manchester City (now), the major clubs amortisation charges are quite similar. Amortisation is effectively a reflection of gross transfer spend (profits on player sales are dealt with elsewhere) and in recent years United, Liverpool, Spurs and Chelsea have spent roughly the same as each other on gross transfer fees. The January 2011 transfer window is a sharp break from that trend of course. Liverpool's wage bill and amortisation charge both reflect the fact that the club has been run for a decade on the assumption of regular Champions League football. The fall in Liverpool's EBITDA in 2009/10 and the exceptional costs of getting rid of Benitez are reflected in the club's operating cash flow which fell from £36.5m to £23.3m (after c. £4m of working capital inflows each year). In 2008/09, Liverpool spent considerable cash on capex, transfers and other investments. In 2009/10 by contrast (reflecting no doubt both weaker profits but more importantly balance sheet problems) total net investment fell from £56m to £17m. This season's attendances (for a constant 27 home games) are down 4.1% on last season, reflecting the lower appeal of the Europa League vs. the Champions League and the very low attendance for the Northampton Carling Cup game. League attendances remain strong at an average of 42,820. From a revenue perspective, the fall in overall attendances will be more than compensated for by the 10%+ ticket price rises put through last summer. 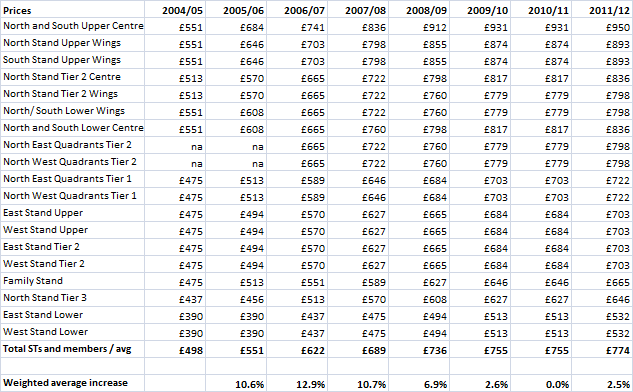 In recent days the club announced 6.5% increases for the 2011/12 season, or 4% excluding the VAT rise. Even taking the latest price rise into account, Liverpool will only earn around £1.7m per home game next season vs. United's £3.6m and Chelsea's £2.4m. Failure to qualify for Europe will reduce the number of home games played next season, offsetting most of the price increase the club are putting through. This season the club will have earned around £6m from the Europa League (using Fulham's run last season as a benchmark). In addition the club will receive an additional £5m from the new Premier League international rights deal and £756k extra for finishing 6th rather than 7th. Total media income of c. £64m for 2010/11 will represent a fall of around 19% on last season which shows how crucial Champions League qualification is to the major clubs. Next season Liverpool will not play in Europe at all, again reducing media income (as well as matchday). Commercial is the area where Liverpool have kept up with their major peers with the signing of two record breaking deals. In September 2009 the club announced a four year shirt deal with Standard Chartered at a total value of "up to £81m". The "up to" presumably relates to playing performance milestones in the deal. If the club earns the maximum £81m, the Standard Chartered deal will be the highest in English football (by way of comparison United's Aon deal is worth £80m over four years and Chelsea's Samsung deal is reportedly worth £36m over three years). Liverpool's first major commercial deal signed under the new owners is with US sportswear company Warrior Sports, a subsidiary of New Balance Athletic Shoe, Inc. of Boston. The deal which starts in 2012/13 is worth a reported £25m a year putting it on a par with United's deal with Nike (the Nike deal is often quoted as being worth £23.3m pa but there was a contractual step-up to £25.4m in 2010/11). The Warrior Sports contract is a fantastic piece of business by Liverpool that doubles the club's income compared to its previous agreement with adidas. As the two new deals kick in, Liverpool's commercial income will become one of the highest in English football. Comparisons are complicated by LFC's inclusion of their in-house media business under "commercial", but excluding this, the Warrior and Standard Chartered deals will push commercial income up to c. £77m pa compared to United's £100m, Arsenal's £44m and Chelsea's £56m. Further progress from this level will depend on the new management team's ability to sign secondary sponsors. This is the area where United has proved so adept in recent years. United's secondary deals (Turkish Airlines, EPSON, DHL etc) will bring in around £44m in the current year, equivalent to all Arsenal's commercial revenue. In total, United earn around £55m from non-shirt and kit related deals compared to Liverpool's c. £30m. Can costs be brought down? As they largely relate to wages, costs are far harder to predict than income and we are left relying on newspaper "estimates" of various players' salaries. Looking at changes to the Liverpool squad since July 2010, it is hard to believe that the salary bill has gone down at all. The summer 2010 transfers may have led to a modest fall in costs as Mascherano and Benayoun departed and Cole and Meireles joining, but the January flurry probably increased the wage bill. Torres was reputedly paid £110,000 per week, whilst most estimates put Carroll and Suarez on c. £80,000 per week each. Daglish's new three year contract is presumably on comparable terms to the £3-4m per annum Benitez and Hodgson earned at Liverpool. More importantly, it is widely agreed that the squad needs strengthening and that in today's inflationary environment (and despite a number of promising home grown youngsters) that almost certainly means another increase in the wage bill. It will not be clear until next year when the 2010/11 accounts which of these facilities have been used by the club (and possibly not even then if the revolver and letters of credit are used to support seasonal cash flow). In interviews, J W Henry has mentioned the retention of £37m of "stadium debt" and again it is not clear how this relates to the £47m term facility (is £10m undrawn?). The club's previous working capital facility (totalling £97m and including £37m of stadium debt) had an average cost of 450bps over LIBOR, and it would be reasonable to assume that margin had fallen with the new facilities (to perhaps 350bps). With 3 month LIBOR still at a rock bottom 0.26%, this would make the new facility pretty cheap for Liverpool, costing c. £1.4m for the aforementioned £37m rising to £3.5m if all the facilities were fully drawn. 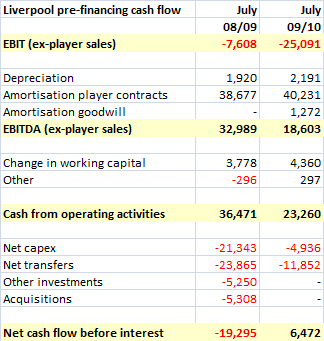 At 31st July 2010, Liverpool's (seasonally high) cash balance was £18.9m, a level that is unlikely to have changed much in the subsequent financial year given the low net transfer spending and moderate EBITDA. The challenge for the club and its balance sheet is of course what to do about the stadium. Despite recent ticket price increases, the matchday income per game generated by Anfield is far too small compared to the club's principle rivals if Liverpool want to maintain a competitive squad and firepower in the transfer market. Since Fenway took over there has been much debate and speculation about whether the new owners will decide to build a new stadium in Stanley Park or refurbish Anfield. Financially, neither option is easy. A new stadium would cost £350-400m but could generate significant naming rights and allow a huge expansion of corporate hospitality facilities (a necessary evil in a modern ground). The cost of the refurbishment option would be significantly lower but still expensive given the configuration of the ground, the possible need to move roads etc. A refurbishment would not increase hospitality facilities as much as a new build and naming rights would be lower. The previous owners' plans envisaged a 73,000, whilst any remodelling of the existing ground would only increase the capacity to c. 60,000. The new Financial Fair Play rules exclude investment in facilities from "relevant expenses" and the owners could theoretically just pay for a new stadium for Liverpool. It is clear from the debate over Liverpool's future ground that Fenway Sports Group are not the "benefactors" in the mould of an Abramovich. It is likely that the vast majority of any stadium costs will come from debt (as was the case with the Emirates of course). This debt burden will have to be serviced by the club and with EBITDA running below £30m per annum, the challenge is clear, especially when investment in the playing side is needed to get Liverpool back into the top four. Football clubs normally end up in financial trouble when they spend in anticipation of a level of success they do not achieve, and persistent finishes outside the top 4 increase that risk for Liverpool. Having qualified for the competition in all but one season from 2001 to 2009, Liverpool is set-up as a Champions League club in terms of its wage structure and transfer policies, but to get back into the Champions League it needs to invest even more on the playing side and in the longer term it needs to take on substantial stadium debt just to catch up with its peers. That is a very difficult and narrow path to tread for owners who seem unlikely to inject significant equity and wish instead to rely on self-generated funds. In 2009/10, the Champions League and Europa league contributed £12m (28%) of the club's matchday income and £27m (34%) of media income. In the current season that combined £39m has probably fallen to around £16m. In 2011/12, Liverpool will earn precisely zero from these European competition and even with the Standard Chartered sponsorship contributing and the Warrior Sports deal to come, the revenue outlook is poor without a major improvement on the pitch. Weak revenue in 2010/11 and 2011/12 means that EBITDA will remain under pressure at precisely the time when the club needs both long and short-term investment. Liverpool fans will no doubt be optimistic that Kenny Daglish can swiftly return the club to the upper echelons of the table, but the scramble for Champions League places has of course become more competitive with the rise of City and Spurs; six into four doesn't go. Financial Fair Play and the Champions League bonanza in combination impose a dangerously perverse set of risks on top clubs. Consistent CL qualification can only be achieved with a £100m+ squad, but a £100m+ squad is really only affordable under FFP if a club qualifies.... Failure risks leaving clubs breaking the FFP rules. To avoid this catch 22, clubs must scramble around for more commercial or matchday income, but in LFC's case the latter route is fraught with problems. Will Fenway's famed US sports experience steer them through all this? Only time will tell. Published last week, Red Football's results for the three months to 31st March 2011 have been absolutely rightly overshadowed by events on the pitch since. Becoming the most successful English league side ever (to go with our long record as the team with the most FA Cup victories) is a stunning achievement and I was privileged to be in the Darwen End at Blackburn on Saturday to see the job done. By contrast to the drama of a season's finale, the Q3 and nine month results contain absolutely no surprises. From a financial point of view a great season is only recognised in the final quarter of the year when TV income from winning the league and reaching the Champions League final is recorded in the accounts. The third quarter is therefore a time when nothing unexpected really happens and with United staying out of the January transfer window there was nothing to report there either! To maintain a decent service for interested readers, here's a brief run through of the main points. Matchday income was actually quite weak in Q3 compared to last year (down 9.1%). This is a little odd given the number of games (9) was identical to last season and the average attendance (74,628) were only 148 lower. There was one additional cup game and one less league game, but prices are identical for both and shared gate receipts are treated as an expense. For the nine months, matchday income was down 3.7% due to one fewer game than last season. The fourth quarter will be better than last year as there will be two more games including a Champions League semi-final for which ticket prices are higher. 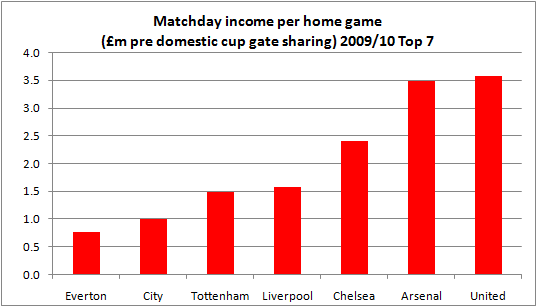 Adding in the US tour, matchday income should be up around 4% for the season compared to 2009/10. The twenty nine games played by United at Old Trafford this season is about as good as it gets in terms of number of matches (unless there are several FA Cup replays in a season). Media income is recognised as games are played. The 9% fall for the quarter and 1.6% fall for the nine months mainly reflect the one fewer Champions League away game vs. last season, something that will clearly reverse this quarter. With United progressing to the Champions League final, the media results for the full year will depend on whether we win or lose. Winning is worth €9m and losing €5.2m. In total, United will receive either c. €52m (£44m) or c. €56m (£48m) from UEFA for 2010/11. This compares to c. £39m last season. Next season, winning the Premier League will increase United's share of the English "market pool" from 30% to 40%, automatically adding €4.2m (c. £3.6m) to media revenue. In the Premier League, the new international rights deal is mainly being allocated to parachute and other solidarity payments. Each Premier League club will receive an additional £5m each. United's total Premier League media revenue will be around £58m. The impact of the automatic Nike step-up, the extra Aon income and the raft of secondary sponsors continues to drive this area of the business. Continued growth into next year relies on further deals, something the ever optimistic Edward Woodward spoke confidently about on the conference call. Q3 is a quiet quarter on the wages side, especially with no major transfer business in January. The club announced new deals for Carrick and Fletcher during the quarter. Looking at the year to date figures, wages are still rising faster than turnover and were up 8.1% during the nine months vs. last season. Other costs were also up 8.1% but were flat in Q3 on the prior year. Wage growth remains THE financial problem in football. Woodward expressed some confidence that the Financial Fair Play rules would dampen wage inflation in the future, but that this effect would not be seen for a while. The transitional mechanisms in FFP mean that clubs have another couple of years to get their houses in order before the rules bite, and that probably means a couple more years of rising costs. The club recognised an interest charge of £34.9m for the nine months (£11.2m in the 3rd quarter). Because bond interest is paid in February and August, the cash interest cost year to date is actually £47.0m. This brings the total cash interest paid by the club since the 2005 takeover to £239m and total costs including fees etc to £369m. The third quarter is working capital negative for all football clubs (cash received from ticket sales and sponsors at the start of the year is being run down as wages are paid). 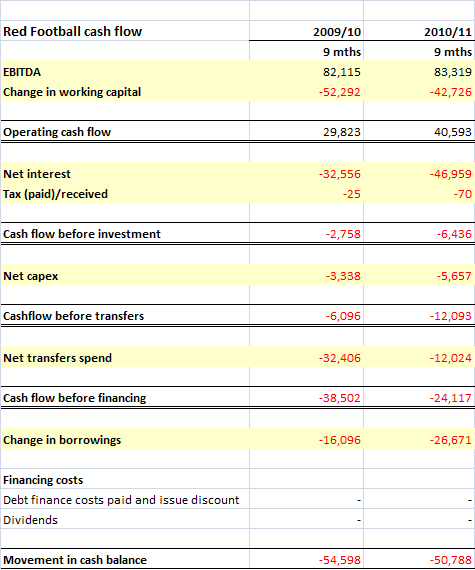 Operating cash flow for the nine months was £40.6m after this working capital outflow. In addition to the £47m spent on interest, the club invested £5.7m in capital expenditure (box refurbs at Old Trafford). Net cash transfer spending (stage payments on Hernandez, Bebe, Smalling and Lindegaard) was only £12m during the nine months. This left cash before financing down £24m. There will be a huge seasonal rebound in cash flow in Q4, last season this amounted to over £60m. In the third quarter United repurchased £5.5m of bonds to take the total buyback for the year to £29.5m (face value). Not all this cash spend fell into the period. At 31st March the club had a cash balance of £113m. With the dollar weakening vs. sterling (and therefore reducing the sterling value the dollar denominated element of the bonds), gross debt fell to £478m. The fate of the repaid PIKs remains a mystery. The club's amortisation charge was down slightly due to limited transfer spending in the last few years. The goodwill amortisation charge should be ignored, it is an irrelevant non-cash accounting rule. The machine hums on at United. These results were dull but next quarter's will be good due to an excellent season on the pitch. The run to the Champions League final will boost both media and matchday this season, but of course such years can't be relied on and underlying, the only real growth is from the commercial arm. So far the commercial arm has done enough to offset cost inflation, and this remains the long term challenge. With the PIKs "disappeared" and Fergie proving he didn't need to spend much last summer, United remain awash with cash. The £113m will rise sharply from now to the end of June. Will SAF spend it? Will it be kept for the next manager? Will the Glazers swoop in and grab it in dividends, something they haven't done so far of course. Only time will tell. I keep getting asked for this so here it is (can send an Excel version if anyone wants one). 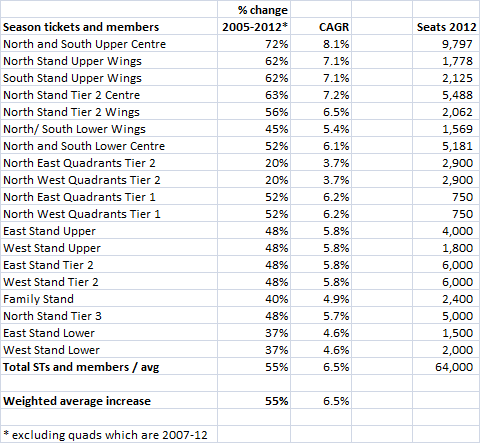 Summary of ticket price changes 2011/12 compared to 2004/05. Full data set (corrections welcome)!